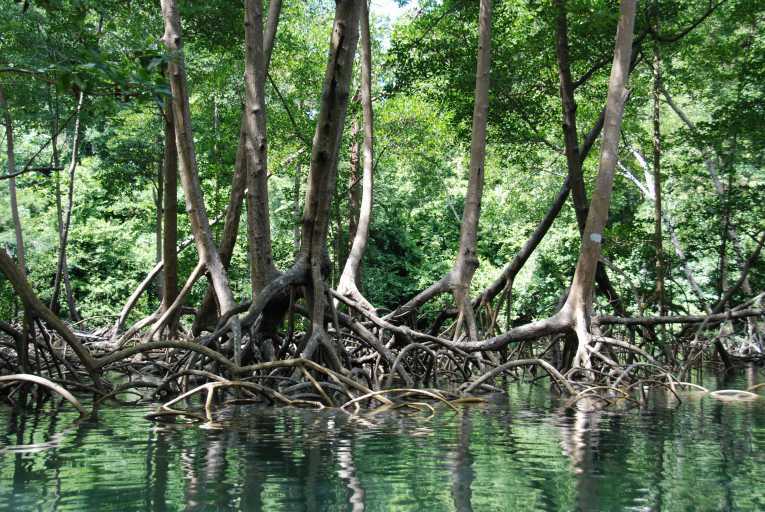 How are Mangrove forests throughout tropical areas of the world responding to the rising sea levels attributed to climate change? Daniel M. Alongi, of the Australian Institute of Marine Sciences, analyzed historic responses to changes in sea levels in Mangrove forests as well as current data to determine how well these forests are reacting to the climate crisis (Alongi 2015). Mangrove forests tend to occupy the border between land and sea in low latitudes, making them especially susceptible to the effects of climate change. Fortunately for mangroves, they have an outstanding ecological stability, in part due to their large subterranean storage capabilities. However, despite responses to develop resilience to environmental disturbances, mangrove forests are still suffering. In terms of human impact, mangrove forests are being deforested at a rate of 1-2% per year, leaving only about a century before these forests disappear entirely. Mangroves are crucial to the environment; they serve as breeding and nursery grounds for fish, birds and other animals, prevent erosion and damage from natural disasters like tsunamis, serve as a renewable source of wood for fuel, and are key components in filtering ocean contaminants. Alongi analyzed how mangroves have historically adjusted to variations in the sea levels over time. Ultimately, the rate of sediment accretion can determine how mangroves adjust to rising sea levels. By looking at the depth of peat deposits, it can be clearly seen that mangroves have had to adapt quite a large amount throughout their existence on earth, dating back to the Late Cretaceous-Early Tertiary Period. After looking at geological records and the peat deposits in various parts of the world, Alongi was able to determine that mangroves have been able to adapt in sync with rising sea levels, except in regions where the rise was most rapid, where they became extinct. Mangroves have also had to respond to variations in temperature, precipitation and carbon dioxide (CO2). In general, more CO2 in the atmosphere leads to growth in mangroves, however this can vary from species to species. When faced with increasing temperatures, plants and animals tend to see increases in functional processes, until a threshold is reached, resulting in a slowing of these processes due to the critical temperatures. Mangroves, given their tropical location, are already close to these thresholds, and are thus highly susceptible to rising temperatures. Mangroves also prefer wet environments where there is more available fresh water. Mangrove forests of the future, according to Alongi, are going to be quite different than the ones found around the world today, primarily less dense owing to the scarcity of available land for forest expansion. Alongi predicts that mangrove forests on arid coasts will decline due to rising salinities and higher temperatures, and will decline in areas succeptible to sea level rise like the Caribbean and tropical river deltas where land for expansion is scarce. On the other hand, Alongi predicts that mangrove forests will expand their latitudinal range as CO2 levels increase in New Zealand, China, and Australia. Consequently, mangroves will survive around the world, but will be under pressure from the effects of climate change, and most importantly the human impacts of deforestation. This entry was posted in Deforestation, Ecosystem services, Pushan Hinduja and tagged Australian Institute of Marine Science, Climate change, CO2, Daniel M. Alongi, Mangrove Forests, salinity, Sea Levels, Temperature, Tropical by Emil Morhardt. Bookmark the permalink.